Long-time readers of Reinventing Parking will remember Adaptive Parking. Today I want to share a short reminder of the key elements. 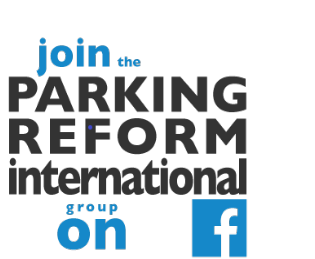 It is a simple set of action principles for parking reforms along broadly Shoupista lines. Adaptive Parking aims to make our parking supply and behaviour less rigid and more responsive to changing contexts, including trends away from automobile dependence. By contrast, conventional parking policy tends to lock an over-supply of parking into the landscape, regardless of changing transport preferences and urban market trends. By the way, Adaptive Parking seeks to reform parking everywhere, not just in city centres. There are five action principles for working towards more Adaptive Parking. Share! Price! Sweeten! Relax! Choice! Make more parking shared or, even better, make it completely open to the public. Retrofit more districts to become 'park-once-and-walk neighbourhoods'. Price parking queues away, including slow motion and invisible queues (such as waiting lists and cruising for parking). Parking can be rationed in many ways but pricing is usually best. Performance pricing builds responsiveness more than other rationing options. Hear the interests of key stakeholders and, if necessary, sweeten the deal for them. But do so in ways that enhance responsiveness and that avoid undermining the wider reforms. Resistance to this kind of parking reform is usually based on fears of spillover nuisance and of losing existing privileges Creative compromises are needed to ease these fears, to transform them into opportunities (for example, via Parking Benefit Districts) and to boost acceptance of change. If most parking is public and is priced to avoid queuing, and if local stakeholders no longer fear spillover parking, then we can stop worrying about off-street parking supply shortages. We can relax and allow supply decisions to be responsive to local market conditions. Worry more about surplus than shortage. Think about your own local parking policy problems. Could Adaptive Parking help? Hi Paul. There's some interesting ideas in this post.